Our Especially For You Gift Certificate is the perfect gift that captures and reflects the exact feelings that you are trying to express and how much you care. It is a gift of love, gratitude, appreciation and thanks, and it is appropriate for all occasions. Whether it is for a major holiday such as Christmas, Thanksgiving, Chanukah, New Years, Valentine’s Day or Veterans Day, or for a special event such as an Engagement, a Wedding, a Birthday, an Anniversary or a Retirement, give the gift of a weekend of a lifetime. 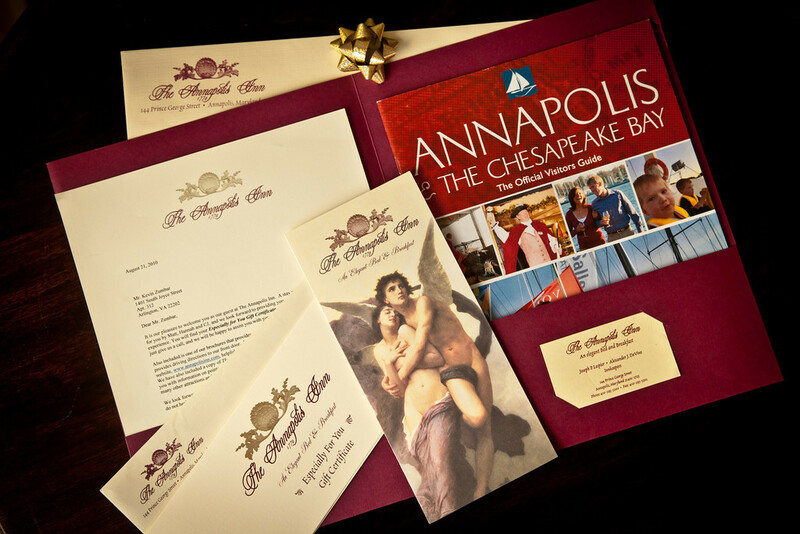 With the Especially For You Gift Certificates, your loved one will have the chance to stay at The Annapolis Inn, a bed and breakfast that seeps romance and the historic charm of the prestigious Prince George Street in Annapolis, Maryland. There is no greater gift than the bestowal of a memory, the opportunity to rekindle and reconnect within our opulent suites. A Gift of Caring Celebration! It is the perfect gift for a loved one, relatives and friends, or for a Doctor, caregiver, Minister, a member of an organization or a service worker who holds a special place in your life and who has extended themselves to you in ways that have touched your heart and have shown you already just how much they care for you. Combine it with some of our “Special Offers” and we can help you design a stay with us that they will always remember. Embrace life’s special moments at The Annapolis Inn.